Many worlds lie beyond this one. Try my patience, samurai, an I will send you to them." Mysterous shapeshifters. Terrifying demons. Bloodthristy ghosts. Mystical dragons. These creatures often appear in the Empire of Rokugan, but where do they come from? The world that the samurai see and perceive is merely one realm overlapping many others, a single piece of a much larger puzzle. Great wonders lie beyond the borders of the mortal realm, but terrible dangers wait there as well. 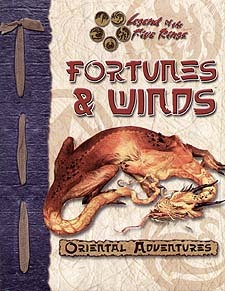 This book introduces the ten Spirit Realms to your Legend of the Five Rings campaign. * Details on ten Spirit Realms, including the Realm of Hungry ghosts, the Celestial Heavens, and the foul pits of Jigoku. * Rules for creating shapeshifter and returned-spirit player characters. * New creatures and magic from the various Spirit Realms. * Up-to-date story information, revealing details on the origins of the deadly Tsuno, the enigmatic Naka Tokei, and the nightmarish Onisu. * New feats, Advantages, and many other new character creation options. Dungeon Masters running d20 System games will need a copy of hte Player's Handbook, the Dungeon Master's Guide, Oriental Adventures, and Rokugan. Players will need only a Player's Handbook.